In June 2010, editor, writer and retired geologist Ian Nowak, along with his wife Margaret, boarded Polar Pioneer for a two-week voyage to wild Scotland and the Faroes. Ian shares some glimpses from that remarkable trip. Those fourteen days were one of the most sustainedly exciting periods of my life—geology, ornithology, wildflowers, and bouncing about in Zodiacs in sea caverns—but beyond that was the sheer beauty and emotional saturation of ‘being there’, immersed in human history spanning the Stone Ages to our own times. The Scottish Isles are cold, windswept, green and treeless blobs of hard tough rock, mostly volcanic, upon which centuries of hardy folk have, for reasons which defy my logic, persisted in eking out their existence running hairy sheep and cattle, plundering the eggs and oils of more than enough gannets, puffins, petrels, gulls and fulmars, digging peat to provide basic warmth, breeding to their own strict codes, and singing songs and dancing in defiance of a number of saints who presumed to know what was good for their spirits and afterlife. The island of St Kilda had been etched onto my mind as a place of lonely, dark and windswept mystery, where the chance of landing was in the lap of the sea gods and the weather. 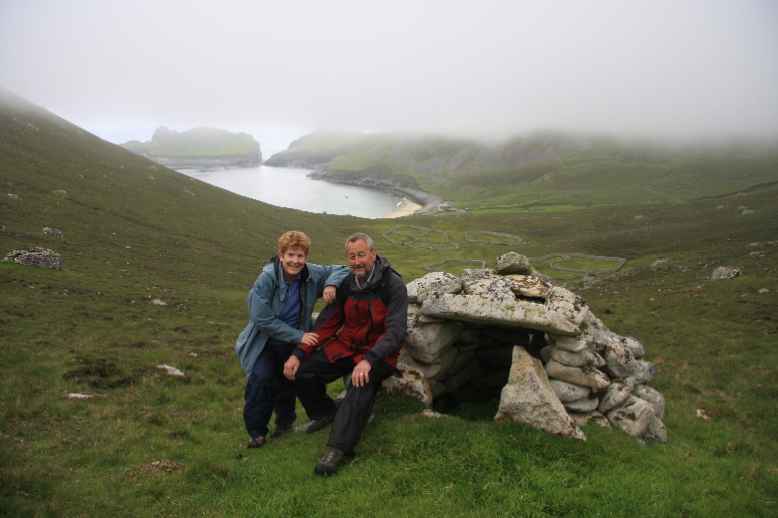 I never dared imagine I would one day be exploring St Kilda’s main island of Hirta. We hiked to The Gap, a half saddle with a sheer drop-off that overlooks the ocean. At the top, between episodes of swirling mist, were nesting fulmars aplenty and a plethora of hardy wildflowers. On the way down, we scrambled around the ruins of cleits—rock shelters used to store goods from peat to grain to salted carcasses of sea birds—then on to Hirta’s ‘High Street’, a desolate row of cottages abandoned when the last settlers were forced to leave the island in 1930. To the northeast, the remote Shetland Islands lie north of 60° latitude, and it was here we explored the coastline of Papa Stour with its network of caves and narrow, steep-sided inlets. Semi-submerged skerries and high, jagged stacks gave our Zodiac drivers plenty to think about as we drew close. The Zodiacs are so stable that there was hardly time or need to worry as we were lifted almost to the roof of the cavern we had entered. Suddenly, we were floating more gently on the quieter waters of the inner cave, from where we watched the local cormorants, shearwaters and fulmars. Even more remote are the far-flung Faroe Islands, a self-governing dependency of Denmark where Faroese remains the native language. The islands’ north-west coastline, with its solid wall of towering cliffs (the world’s highest, over 500 metres), is laced with chasms and caves. Here, our Zodiac cruise along the Vestmanna Bird Cliffs was mind-blowing. We ventured into several chasms and into a network of caves and caverns that eventually led us back out to the ocean. The kittiwakes, guillemots, gulls, puffins and fulmars were less concerned with the remarkable geology as with decent nesting ledges and crannies. As it was with our earlier Aurora Expeditions’ voyage to the Antarctic, the moods of the Scottish and Faroese landscapes, the weather, the wildlife—and on this trip the local people— stirred my soul in a way not many Australians have been lucky enough to experience.